The IMA iOS SDK v3 allows native application developers to request and track VAST ads in the iOS (9.0+) environment. For a detailed list of the video ad features supported by each of the IMA SDKs, see Video features & SDK Compatibility. Read through our compatibility page to make sure your intended use case is supported. Rather than the sample player, if you'd prefer follow along with a finished IMA SDK integration, download BasicExample.zip or view it on GitHub. With that file created, run pod install --repo-update in the same directory to automatically download the IMA SDK. 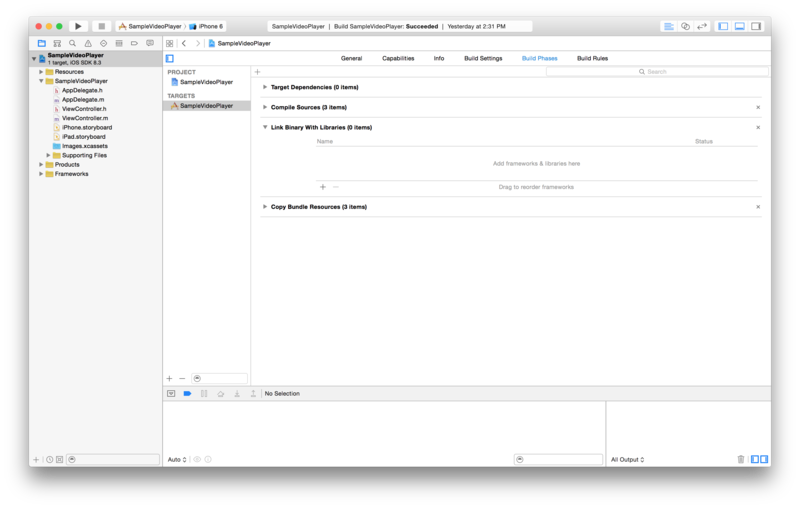 Once that command completes, open the .xcworkspace file in Xcode. Inside the Xcode Workspace, you'll see two projects: one for the SampleVideoPlayer, and the other for the dependencies installed by CocoaPods. Click Add Other and navigate to the downloaded, extracted zip. Select GoogleInteractiveMediaAds.framework and click Open. Click the plus sign again, scroll down, select WebKit.framework, and click Add. Include the -ObjC linker flag in your build settings. See Apple QA1490 for more information. In order to play mid-rolls, the SDK needs to track the current position of your video content. For it to do this you'll need to create a class that implements IMAContentPlayhead. If you're using an AVPlayer, the SDK provides the IMAAVPlayerContentPlayhead class which does this for you. If you're not using AVPlayer, you'll need to implement IMAContentPlayhead on a class of your own. The below snippet shows how to set up a playhead tracker for an implementation that is using an AVPlayer. // Set up our content playhead and contentComplete callback. // Make sure we don't call contentComplete as a result of an ad completing. // NOTE: This line will cause an error until the next step, "Request Ads". Now that you've defined your content playhead, you're ready to make an ads request. To request ads, you'll need an instance of IMAAdsLoader, an ad tag, and an ad display container. You'll also need to change some existing code to make sure ads get requested when the user clicks the play button. You should maintain only one instance of IMAAdsLoader for the entire lifecycle of your app. To make additional ad requests, create a new IMAAdsRequest object but re-use the same IMAAdsLoader. For more info, see our FAQ. The ad display container must be viewable for accurate viewability measurement. // Re-use this IMAAdsLoader instance for the entire lifecycle of your app. // NOTE: This line will cause a warning until the next step, "Get the Ads Manager". // Create an ad display container for ad rendering. // Create an ad request with our ad tag, display container, and optional user context. // NOTE: This line will cause an error until the next step, "Get the Ads Manager". At this point you're requesting ads and should be getting a response from the ad server, but no ads will play. To show and play ads, you'll need to work with the IMAAdsManager. If your ads request is successful, the SDK will create an ads manager and pass it to you in the adsLoader:adsLoadedWithData method. Once you have your instance of the ads manager, provide it with the ads rendering settings and content playhead you defined earlier. If using multiple threads, you must initialize UI objects on the main thread. // Grab the instance of the IMAAdsManager and set ourselves as the delegate. // NOTE: This line will cause a warning until the next step, "Display Ads". // Create ads rendering settings and tell the SDK to use the in-app browser. // Initialize the ads manager. // Something went wrong loading ads. Log the error and play the content. // When the SDK notifies us that ads have been loaded, play them. // The SDK is going to play ads, so pause the content. // The SDK is done playing ads (at least for now), so resume the content. // error and play the content. That's it! You're now requesting and displaying your first ads. /// UIView in which we will render our AVPlayer for content. /// Entry point for the SDK. Used to make ad requests. /// Playhead used by the SDK to track content video progress and insert mid-rolls. /// Main point of interaction with the SDK. Created by the SDK as the result of an ad request. // The content URL to play. NSString *const kTestAppAdTagUrl = @"https://pubads.g.doubleclick.net/gampad/ads?sz=640x480&"
// Load AVPlayer with path to our content. // Create a player layer for the player. // Size, position, and display the AVPlayer. 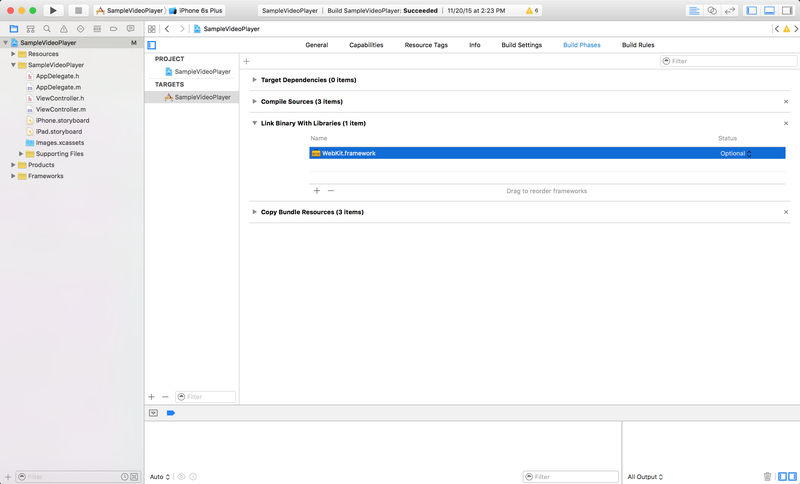 // Create ads rendering settings to tell the SDK to use the in-app browser. // When the SDK notified us that ads have been loaded, play them. static let kTestAppContentUrl_MP4 = "https://storage.googleapis.com/gvabox/media/samples/stock.mp4"
@IBOutlet weak var videoView: UIView! // Create ad display container for ad rendering.